What do cross-country road trips, wedding speeches, and social media marketing have in common? You could improvise all three, but it’s better to have a plan for what direction you’re heading — especially when developing your social media content strategy. By now, most marketers recognize that social media plays an integral role in an effective inbound marketing strategy. And with so many social networks to manage and publish on, it’s important to stay organized and have a plan for when and what you’re going to share on these platforms. In this post, we’ve rounded up some of the most helpful tools and templates for building out an effective social media content plan. Check them out below. We’re all busy. And when we’re busy without a plan in place for the tasks we have to get done, things inevitably slip through the cracks. Social media content is no exception. Just like with blogging, a successful social media strategy requires regular publishing and engaging with followers to see positive results — whether that be in terms of SEO, brand recognition, lead generation, or all three. Calendars help you get organized to avoid the dreaded scramble when things come up. With a social media calendar, marketers can plan out posts for entire weeks or months in advance, which frees up working hours to strategize for the future — and to dash off any posts about breaking news in your industry. Otherwise, you’ll spend valuable time each day searching the internet for that day’s content to share, which is a known productivity killer. A calendar helps you plan for each social network to customize posts instead of spamming all platforms with the same message. Social media marketers should take the time to craft custom messages for each network, and doing this in advance will save time throughout the week and ensure you’re being thoughtful and intentional when you do post. 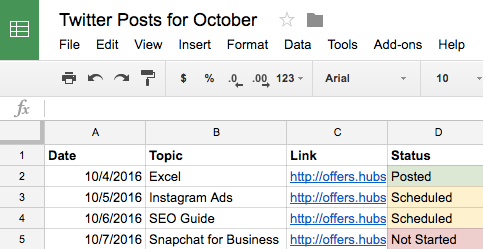 Calendars can help you track performance and plan for future posts. Without a calendar, social media marketers are publishing content into the void and are unable to track big-picture and past performance. With a calendar, marketers can look back and analyze which content performed best so they can adjust their strategy accordingly. With the help of a calendar, marketers can plan for holidays and observance days, such as National Cat Day, when they can tailor their content and engage with a wider audience. Social media calendars improve efficiency. According to Content Marketing Institute, 72% of B2B marketers attribute the success (which has increased annually) of their content to the development of a formal content strategy. Now that you understand the merits of having a social media content calendar in place, check out our list of top tools to stay organized and on top of your game. Trello is another organizational tool that’s highly effective for team collaboration. 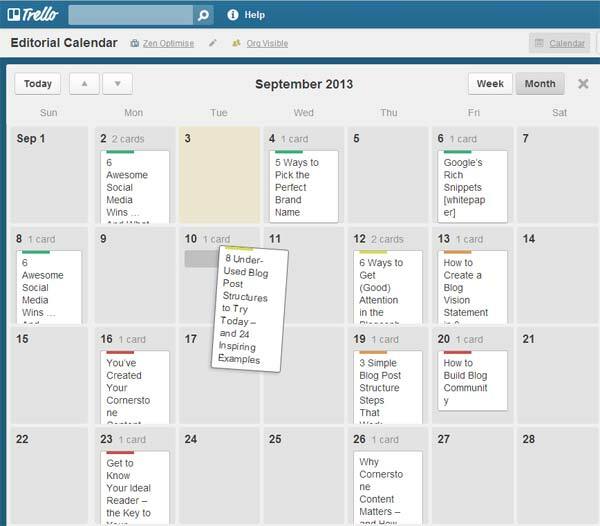 More specifically, social media managers can use Trello’s flexible assignment “cards” and customizable “boards” and “lists” to map out to-do lists, manage a content calendar, plan a campaign, and house ideas from a brainstorm. But you’re not limited to just one structure: Users can customize boards according to their needs. For example, a team could create a board to organize social media posts for a given week, on a specific platform, or post ideas around a topic, such as a campaign or awareness day. Trello cards allow for a ton of customization as well. 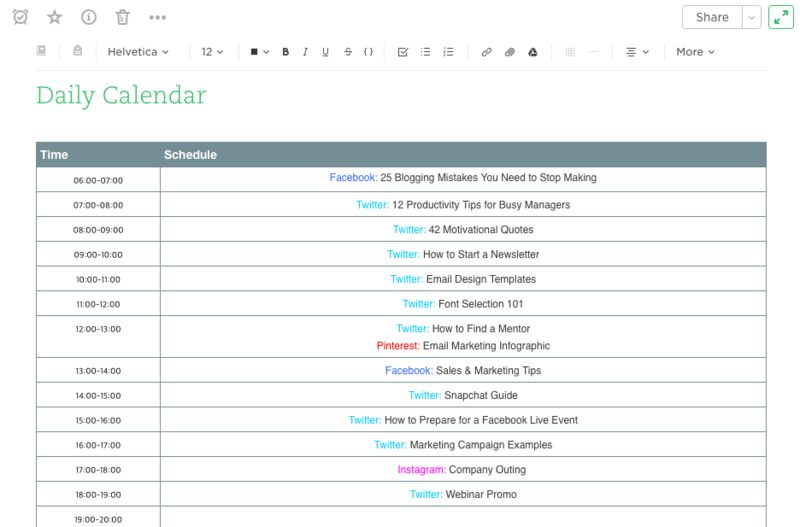 Here’s a fictitious social media editorial calendar card with Twitter copy options around a piece of blog content. Note that you can track progress toward completing a checklist, which could be useful for social media marketers looking to track campaign progress. 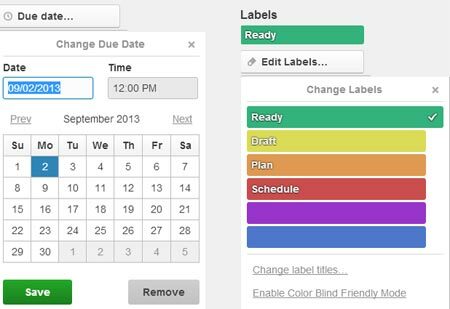 Additionally, Trello cards can be assigned to different team members, marked with due dates, and commented on. Users can even customize the labels (as in the image below) with different publication statuses so the entire team can see the progress of their social media posts and when they’re due on the calendar. The labels could also indicate different social networks that content is being published on. Trello also offers a full calendar view (shown below) which makes it easy to visualize what content is going out, and when. Marketers might already use Excel for different types of reports and data analysis in their roles, but it’s a highly useful tool for social media content calendar organization, too. Excel can be customized according to whatever priorities or metrics a team is focused on, so it’s a great tool for planning ahead. The good news? We’ve already done the heavy lifting for you by creating a free, downloadable social media content calendar template using Microsoft Excel. 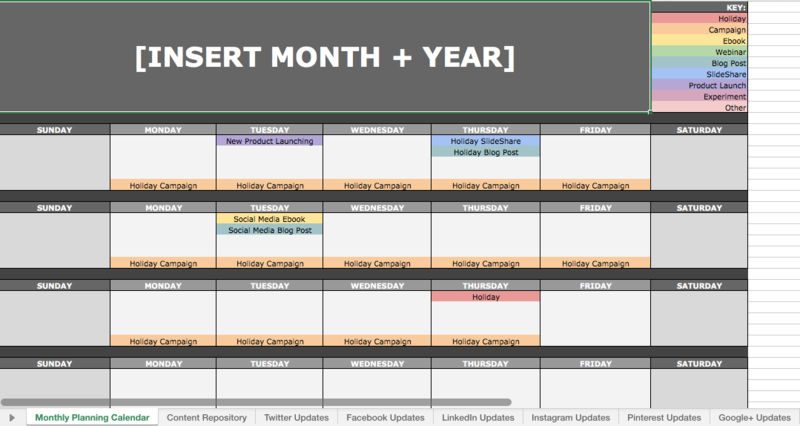 Marketers can use this template to easily plan out individual social media posts — monthly or annually — while keeping an eye on bigger picture events, holidays, publications, and partnerships. For more on how to use the templates, check out this in-depth guide from my colleague Lindsay Kolowich. Use the Monthly Planning Calendar Tab above to get a bird’s-eye view of what’s coming down their content pipeline in a given month. In the Content Repository tab, users can record the content they’re publishing on this tab to keep track of which pieces have been promoted and to easily recall older content that can be re-promoted on social media. On the Social Network Update tabs, users can draft and plan out social media posts in advance. These tabs are for organizational purposes, and the content of the posts themselves must be uploaded into a social media publisher. Evernote is a note-taking app that marketers can use to keep track of all the moving parts that comprise a social media campaign. Another useful feature? 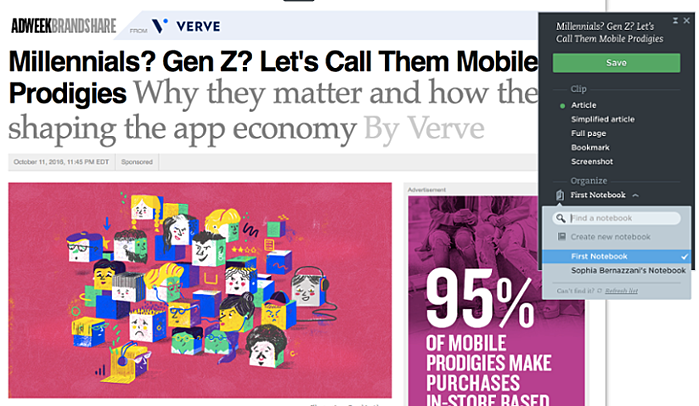 Evernote’s Web Clipper extension for Chrome. Marketers can use this tool to easily save links to their Evernote Notebook for sharing later on. The Evernote mobile app also boasts some interesting features to help marketers keep their social content ideas straight. For example, you can easily snap a photo and save it to your Evernote files for review later. This feature is of particular valuable for social content creators looking to maintain a backlog of photos to publish on Instagram. Google Drive has several helpful features that make it easy for social media marketers to build out an effective content calendar. Here’s an example of how a team might use Google Calendar to track both their editorial and social media calendars to make sure they’re aligning posts with new blog content. These calendars can be easily shared with multiple teams to avoid scheduling conflicts and ensure that campaigns are aligned. Marketers can also use shared Google Sheets to schedule posts on social media, track the status of different pieces of content, and assign tasks to team members — all on the same platform as their calendar. With the help of Google Docs, users can keep comments all in one place and can collaborate on different projects without emailing back-and-forth or having to schedule a meeting. This is a particularly useful feature when editing content for social media, which may need to be drafted and approved quickly. Now that we’ve reviewed a few helpful tools to kick your social media strategy into high gear, experiment with them. Every social media team is different, and it could be a combination of these tools that helps you execute your strategy efficiently to drive ROI. For getting all of your ideas down and developing a big-picture plan for your social assets, we recommend starting with our template and going from there. 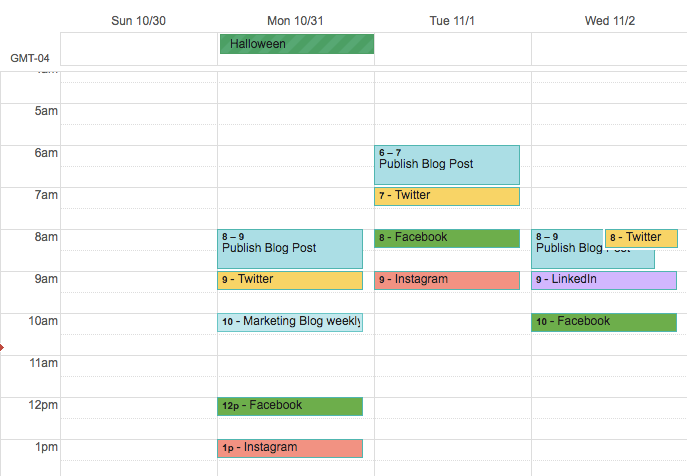 What tools do you use to build your social media content calendar? Share with us in the comments below.